Jeff Balash (MBA '73/74) was one of the eighty graduates who returned to HBS for the program. Rapid changes in technology and the shifting realities of the global marketplace make lifelong learning a necessity for all professional managers, and those in the HBS alumni community are no exception. To give alumni the chance to sample the latest faculty thinking on some of the most pressing business issues of the day, last May the School launched Breakthrough Insights, a new Executive Education program developed especially for alumni. Commenting on the program, Professor Howard Stevenson, senior associate dean for External Relations, emphasized the unique learning environment that exists in a classroom of experienced alumni students. Building on this knowledge, Breakthrough Insights is content-rich, designed to stimulate the sharing of a variety of useful new ideas for business leaders rather than to focus on a single topic. For people who are doing important things, even one thought-provoking idea can create a ripple effect when participants return to their companies, said Stevenson. In creating the program, Professor Richard Vietor, senior associate dean for Executive Education, sought to achieve broad-based appeal by selecting five faculty presenters with recently published research in several different areas. The approach evidently succeeded, as the program sold out, attracting eighty attendees from nineteen different countries. Just over half were MBA alumni, with the balance divided evenly among AMP, OPM, and PMD graduates. Participants got acquainted Sunday at a reception and dinner, and classroom discussions began Monday morning with Associate Professor Michael Watkins, author of Breakthrough Business Negotiation. Watkins taught a case exploring the unexpected challenges faced by M. Douglas Ivester in exercising effective leadership during his two-year tenure as chairman and CEO of the Coca-Cola Company. 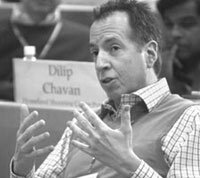 Professor Richard Tedlow then dealt with leadership issues from a historical perspective, focusing on Charles Revson, the colorful Revlon founder who was among those profiled in Tedlow's recent book, Giants of Enterprise. His session examined the roots of eth-ical decay in America's quiz show scandal of the 1950s, which was driven in part by the aggressive tactics of key sponsor Revlon. The next morning, Professor Debora Spar also turned to history for context. Advancing themes from her book Ruling the Waves, Spar illustrated how recent revolutionary technological developments in fact can be seen as replays of past situations where pioneers of free enterprise tangled with the interests of government. Her case focused on Network Associates' efforts to market its encryption software algorithms globally, despite national security concerns raised by the U.S. government. By Tuesday afternoon, participants seemed to have settled back into the classroom quite comfortably, as Professor David Yoffie observed at the start of his session: Two minutes late starting, and half a dozen seats are empty — some things don't change. Yoffie launched a case discussion analyzing Microsoft's success, using it as a springboard to introduce the principles of judo strategy from his recent book of the same name. Yoffie suggested that using the judo strategy approach allows small, agile start-ups to turn an opponent's size into a disadvantage. The closing presentation was delivered by Senior Research Fellow and Director of the HBS Life Sciences Project Juan Enriquez, who described the wide-ranging effects of the mapping of the human genome. He asserted that having incomplete understanding now doesn't lessen the technology's impact. Not knowing what the continents looked like didn't alter the fact that the world had changed in 1492, said Enriquez, invoking the voyage of Columbus. He illustrated his argument with a case on the biotechnology firm Biogen, where a seemingly innocuous decision to license databases of new proteins discovered through genomic research wound up completely transforming the company's product-development process.